Warning: This post isn’t about skin. I know I mostly write about skin but this week something else is on my mind and it’s my blog and I can write what I want to (insert evil laugh here). A few days ago was Christmas and it was the best Christmas I’ve ever experienced. Mainly because of my almost two year old, Charlee. This was the first Christmas she knew how to open presents and recognized Santa, snowmen, lights and Baby Jesus. When we woke up Christmas morning I asked her if she wanted to see what Santa brought and go open presents, she said “no”. I giggled because I knew she had no idea what was about to happen. She certainly didn’t remember last year at 10 months old. When we walked towards the Christmas tree she spotted the new toy kitchen Santa brought and she lit up with excitement, smiled and said “WOW!”. All you parents out there know this is a moment that turns you to mush and you wonder how your heart could be any happier. She rushed around the kitchen trying to see everything as fast as she could, I don’t remember ever feeling so content. The day just got better as it went on. All the family members we visited got to see some of Charlee’s joy as she opened their presents. It was so satisfying to see her spread her cheer and make my loved ones just a little bit happier and cheerful. I laid in bed Christmas night snuggling with her (yes I let her sleep with me sometimes, don’t judge) and thinking about how much happiness she brings me and others around her. I wished I could make people around me feel half as good as Charlee makes me feel. So since Christmas I have been thinking about what I can do to be more like my two year old, to spread happiness and cheer to those around me. Here’s my list so far. 1. Give more. I got more gifts for Christmas than I could ever ask for but nothing I received made me as happy as seeing her excitement while opening her presents. Think about it, you always have more cheer when giving than receiving. 2. Be Happy. Charlee was so happy when she pulled a pair of socks Santa stuffed in her stocking last minute. It didn’t matter what gift she received she is just happy. Being around that happiness makes me happy. I’m going to make a conscious effort to be happy more often. Hopefully, my happiness will rub off on those around me. 3. Show excitement for the small things in life. It didn’t take hardly anything to get Charlee excited on Christmas day. I asked her ,”Do you want to help Momma open a present?” and she jumped up and down and yelled “PRESENT!!”. I’m going to be more excited for the small things like getting to spend dinner time with my husband, step-kids and daughter. How blessed we are to sit, enjoy each other and eat a warm home cooked meal together? I’m going to start showing excitement for these small things so that my family can share some of that excitement with me. 4. Love unconditionally. Charlee may have gotten just a little too excited on Christmas day and didn’t want to eat nor nap which led to a little spanking. Yes, my almost two year old misbahaves contradictory to her angelic appearance. But even after a little spanking she hugs me, kisses me and then is just as cheerful as she was before. She doesn’t let it get her down, she loves me unconditionally. It gives me peace to know she loves me no matter what. I want those around me to have that calm heart and peace too! So from now on, I will try harder to be less judgmental and love unconditionally. 5. Be more carefree. Charlee didn’t worry about whether or not the turkey was going to be hot when guests were ready to eat. She didn’t worry all day about being on time or if Aunt Susie Q was going to like her gift. She just went through the day carefree, soaking it all in and enjoying the great time she was having. More often, to be cheerful and spread joy, I need to, in the words of Elsa, “Let it go!”. I hope in 2015 I can spread some cheer and joy to all of you. Whether through my blog or through the clinic or if you ever need anything, through a knock at my door. I will be honored to spread cheer and joy in your life. May we all spread half of the happiness that Charlee spreads at only 1 year old. As I’ve mentioned before I like scowering social media and blogs for what people are saying about skin and skincare. Sometimes just for a laugh but most often because I like to know what’s popular and what’s out there that my patients are using whether its harmful or helpful for skin. Recently I have come across lots of homemade remedies. I don’t know if it’s the cold weather or the holiday season but everyone seems to have a recipe for some miracle lotion or potion. The ingredients vary from foods to dirt. I mean some of the recipes sound so strange I wonder who would even put that together in a bowl let alone on their skin? But they all promise christmas miracles such as curing psoriasis when no dermatologist could and taking away wrinkles when Botox didn’t work. Absurd ideas but for the cheap prices of the ingredients, if it did work, it would really be the best thing ever. So it got me to thinking… I’m the skin expert, right? Shouldn’t I have a little secret trick recipe up my sleeve? Well the answer is no, but out of blogger envy and just wanting to have a little fun I made one anyway. My favorite moisturizer for my legs is vaseline. I often recommend to my patients petroleum jelly or crisco shortening. So I knew my recipe would have vaseline and shortening because two is better than one right? I chose to use coconut oil instead of crisco because coconut oil is thought to have some anti-inflammatory properties and because it makes me feel fancier than crisco. Then, for all those people who complain about that being too greasy I decided to cut it with one of my favorite lotions, Cetaphil DailyAdvance Ultra Hydrating Lotion. Here is where most other recipes go wrong. They start adding smells and colors and all kinds of skin irritating ingredients. Not this girl, I stopped there. 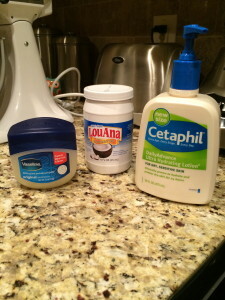 I then threw into my mixer all 7.5 ounces of the petroleum jelly, half of the 14 ounce jar of coconut oil and the entire 16 ounces of the Cetaphil lotion. 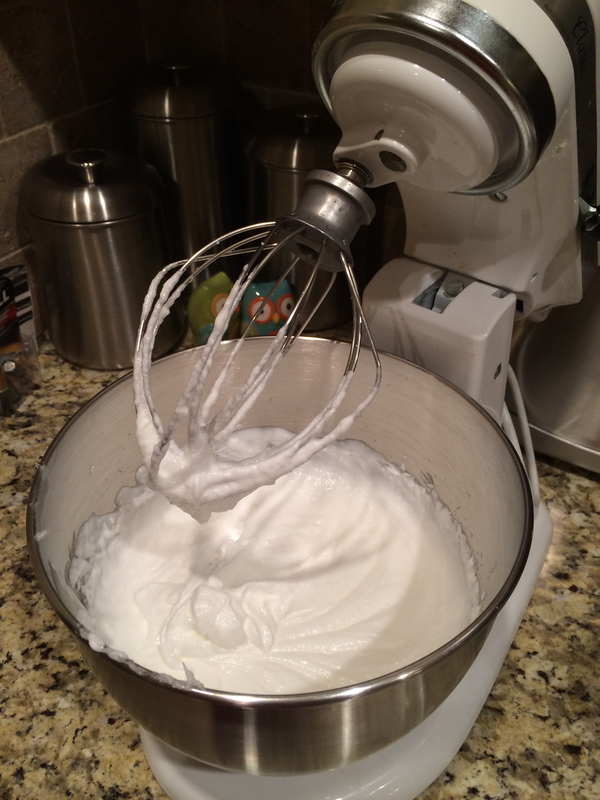 At first it frightened me because it didn’t look like the ingredients would marry each other,lumpy at best……..Then I got to whipping and the angels started to sing. I had to refrain from licking the spoon because it looked so light and fluffy, like meringue. I then placed it into mason jars. The recipe made a little more than two jars. I put a store bought red bow and tied a ribbon around the mason jar (that’s as Martha Stewart as I get) and gifted one jar to my Mom. The other jar I put in my shower to use right after showering to lock in the moisture and keep my skin nice and soft all winter. I hope you enjoy the Copeland Christmas Concoction recipe for your skin this week. I don’t promise that it will do anything other than be a really fluffy, yummy, sensitive skin moisturizer but that’s more than most of the online skin tips can do! I also hope that you all enjoy this time off with your family and friends whether you are celebrating Christmas and the New Year or not. This time of year everything closes (even just for a few days) and we are all forced together. It really is a wonderful, magical time! I wish you all happiness, joy and blessings! Merry Christmas to all and to all a skintastic night! This weekend was an awesome Mom travel weekend. I started it off right with a no kid allowed Garth Brooks concert with my husband and BFF in Little Rock. Next, I picked up the kiddos in Fort Smith and headed for Branson, MO. It was one of those weekends that is really hectic in a good way. When we got home from Little Rock I was so tired from staying up later than 9PM while pregnant but had to pack and get ready for Silver Dollar City. If you have an almost two year old you know that means taking half of your home. Why do they need so much stuff to travel? While in Branson we napped in strollers and had french fries for meals because that’s what you have to do on vacation to be able to fit it all in right? By the time you get back to your hotel you are just proud that your headcount is the same as when you left the house. It’s the best times, the best memories and I wouldn’t change it for anything! I will say though my skin care gets put on the back burner, I mean I’m just like most women, most things for myself get put on the back burner. When I laid my head on that pillow I just couldn’t make myself get up to wash my face. I know that sounds bad and it is, but sometimes you’re just too tired. So I did what any good woman would do and asked my step-son to hand me a facial cleansing wipe, wiped down my face, rolled over and went to sleep. Not ideal but thats real life. So here are my real life woman skin care travel tips. Some tips to help you not completely fall off the skin care wagon during your travels. 1. Bring cleansing wipes- By far my favorite are the Cetaphil gentle skin cleansing cloths. They are soft and gentle and don’t burn. I even use them to remove make-up over my eyes. You need these for that “I’m too tired to move” moment. They come in a blue package. 2. BOB sunscreen- BOB stands for Brush on Block. Yesterday we were walking around Branson Landing and even though it was cool out the sun was really shining. Thank goodness I keep a BOB in my diaper bag. It’s powder sunscreen that goes on clear. One of my favorite things about powder sunscreen is you can throw it in any bag and not have to worry about leakage. The powder is nice because you don’t have to worry about messing with your make-up and it’s so easy to apply on kids on the fly. 3. Baby powder/dry shampoo- Saturday is my hair wash day but when I am traveling I have to stretch it out to Sunday.One bathroom with 5 people to shower and get ready does not allow me to blow dry and style this mop. I am usually pretty greasy haired by Saturday so to be able to stretch it out I need some help. Some of my friends use dry shampoo. I personally am kinda cheap so I just put some baby powder on my finger tips and apply it to my scalp to take some of that oily shine out. It works great and is super cheap. 4. Skip your skin care regimen and don’t fret- You’re on vacation! Do I advise not using your retinol for a couple nights? No, but the reality is, it’s fine, get back at it on Monday. Don’t freak out, don’t think your skin is going to go down the pot from missing one night of skin care products. Just like you are allowed to have a donut every now and then when you are on a diet you are also allowed to skip your skin care regimen every now and then without feeling guilty. It’s important to live your life, enjoy it and not worry nor fret! 5. Keep a ziplock bag stocked with travel size essentials. I have a ziplock bag with fragrance free, gentle skin essentials that can make it through TSA at the airport. It’s a facial wash, a face cream, toothpaste, body wash and deodorant. It’s always packed and ready to go in my bottom drawer of the bathroom. It’s easy to grab so I don’t forget anything and get stuck using the high fragrance junk the hotel has provided that always irritates my skin and dries me out. Hope you all have safe travels this holiday season! Enjoy your time with family and friends and stay Merry no matter what stresses the hustle and bustle of the season may bring! You know how you have that one physical feature people seem to notice, such as nice teeth, perfect skin, pretty eyes, perfect pouty lips or maybe nice legs? Well I feel like my thing is my hair. People often compliment my hair. On Saturday I had my cut and color appointment which is always such a fun thing for a lady. Even if just for a few hours it’s all about you, feeling pretty, gossiping with your hair dresser, flipping through a magazine and no kids tugging at your leg. There are so many things out there to color, perm and relax our hair with it gets confusing. Some of the things you are doing in hopes of healthier hair could actually be damaging. By the same token there are some tips you can do to have healthier hair. So here are my top ten dermatologist recommended tips and some of my personal tips for your hair care. 1. Shampoo your scalp not your hair. Your scalp is what creates oil that your are trying to “clean” so if you are trying to rub and scrub all the way at the ends of your hair you could be causing unnecessary damage creating frizzy hair. 2. Always use a conditioner. Sounds like common sense but you would be surprised how many people don’t think they need it. Right now I am using an Agave healing oil once a week and half apple cider vinegar half water once a week. Yes, I only wash twice a week, Saturday and Wednesday. 3. Don’t pull your hair tightly. Be gentle. Tight ponytails and braids can cause damage, even hair loss and scarring. 4. Don’t rub your hair dry with a towel after the shower. Just like I recommend being gentle to your skin by not scrubbing and exfoliating you should be gentle with your hair. When I get out of the shower I just wrap a towel around my hair to get excess water off and then let it air dry as much as possible. 5. Lay off the blow dryer, curling iron and flat iron. High heat can be damaging to your hair. This is one of the main reasons that I only wash twice a week. This spreads out how often I am damaging my hair to twice per week instead of daily. Try to use the lowest heat setting, limit the time the tool is in contact with your hair and let your hair air dry as often as possible. 6. The 100 strokes per day for your hair idea is a myth. Actually the less you brush is probably the better. Don’t tug your hair when you brush it out. Try to use a gentle, wide tooth comb and use a moisturizing conditioner as needed for tangles to be able to gently untangle. 7. How often you should wash your hair varies from person to person. Someone who has really dry hair can go more days without washing whereas someone who has a very oily scalp may need to wash more often. If you are having specific scalp flaking and problems you should see your dermatologist. You may have a medical condition that could be treated with prescription treatments. 8. Pick your products wisely. I always wanted a keratin treatment because some of my girlfriends have had it and their hair seemed so shiny and smooth. I just never got one because of how long they took and cost. Did you know they have formaldehyde in them? I didn’t. I like trying out new products and I am drawn more towards natural products (probably because I have hippies for parents). On Saturday I had an alternative to keratin treatment that is formaldehyde free and “natural” called Agave Oil treatment, so far so great! High fragrance products can leave a residue on your skin that can trigger acne. Just be aware and know that sometimes simpler is better. 9. No pooing. I occasionally no poo. It means you don’t use store bought shampoo and conditioner. I wash with a little baking soda and water and then condition with half water, half apple cider vinegar. My hair feels great when I do this but it’s a little extra work making your own products and I’m pregnant with a one year old so I slack sometimes and buy products. The idea is that you don’t damage your hair and you don’t wash away all the good oils and bacteria that naturally live on your scalp. Try it out and let me know what you think. 10. Swimmers- Wear a swim cap to prevent damage from chlorine. Use a “leave in” conditioner before swimming to protect your hair. Wear a conditioner with zinc oxide before going out into the sun to protect your hair (that isn’t protected from your wide brim hat) from sun damage. I hope you all enjoy my hair care tips! My hair dresser is amazing, she’s like family. Her name is Cindy Pabone and she has a booth at Vogue Aesthetics. 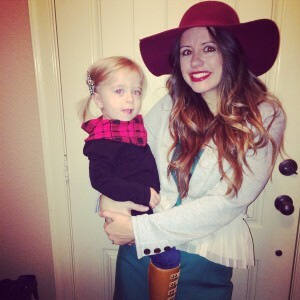 I have teamed up with her for an awesome giveaway! To enter share the link to this post to your Facebook or Twitter with #theskinnyonhair and you will be entered in a chance to win a Johnson Dermatology goodie bag including some skin goodies and a $35 gift card for a hair service with Cindy. So go, share away! Don’t forget #theskinnyonhair because that is how I will find/pick a winner! Thanksgiving is over. I hope everyone had a wonderful, thankful, blessed holiday. Nowadays thanksgiving is the kick-off for christmas. Black Friday shopping now starts the evening of Thanksgiving, slightly irritating to me. I just hate to feel like we are skipping Thanksgiving because it is one of my favorite holidays! I do love this holiday season. It’s a time of year when everyone slows down a little bit and spends time with each other. I mean even Wal-Mart closes on Christmas. At this stage of my life I no longer see my childhood friends on a daily basis. Most of us have moved away due to work, school, husbands or whatever. During the holidays though, we are all back home in Fayetteville and always find a little time to reconnect. It’s so nice to see those friends that even if you don’t see each other outside of weddings, funerals and holidays the minute you say hello it’s like you were never apart. It’s one of the best parts of the holidays, extended time with family and friends. True friends share their secrets and tricks of the trade. A hairdresser friend will give updates on new must-have products. Friends with kids give advice to friends without. Traveling friends give advice to the less traveled. You get the point. So this post is to let you in on the skin holiday “must haves” I recommend to all my closest friends. 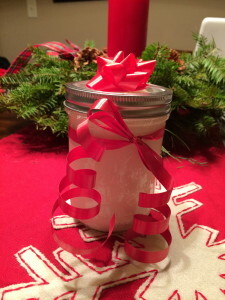 After you read my top five holiday “must haves” don’t feel embarrassed that you need them now and can’t wait to make them stocking stuffers (I couldn’t either)! 1. A perfect holiday red lipstick. If you don’t think you can rock red lipstick then you must try during the holiday. Everyone call pull off a good red in the spirit of the season! I’m obsessing right now over Jane Iredale lipstick in Margi. It is the perfect hottie red lips. Not sticky, doesn’t catch on your teeth, smooth, not too bright, not too dark, perfection of red lipsticks! 2. Clairisonic Satin Precision Brush Head- Have you tried this brush head? For those of you that use a clairisonic brush this is my favorite brush head ever! It is so gentle and luxurious! They advertise it as made for gentle areas like the eyes but I use it all over. Skipping the facial to save during the holidays this month? Promise this is the next best thing! 3. A good mineral based powder. Holidays, otherwise known as the time of the year where you will inevitably have your picture taken more times then the entire year combined. Not to mention half of those will likely show up on social media. You need something to cover that occasional pimple pop-up. I use Colorescience pressed mineral foundation. It covers-up really well and won’t cause break-out but also is so light and airy. As a matter of fact a student asked me last week if we were allowed to wear make-up at work! Which I took as a complement, we at JD just take care of our skin and wear make-up that brings out our NATURAL beauty. 4. Eye make-up remover trick- Okay so you know after you wash your face you have that stingy bit of mascara around your lids that you probably are using an eye make-up remover pad to remove? Well save some bucks and hydrate that skin around your eyes simultaneously by trading your eye make-up remover pads for this trick. Take your favorite light weight moisturizer and put a thin layer on a Q-tip or cotton pad then use that as your make-up remover. It isn’t alcohol based so you won’t burn your eyes nor dry out your skin! The moisturizer will wipe away all that excess make-up without batting an eye (see what I did there?)! 5. Step up your sun protection game- Just because it’s so cold outside doesn’t mean the sun isn’t there. If you see light, UV rays see you! Wide brim felt hats are so in right now and so sun protective. If you see me on the weekends this month you will see me in mine! I use the BOB for sunscreen during most of the year but this time of year all that outside cold wind and temperature changes dry out my skin so I change to Elta MD UV clear broad-spectrum SPF 46. It is made for acne prone skin so it isn’t greasy but it gives me that extra moisture my skin craves this time of year! Hope your holidays are full of joy, laughter and fun! But most of all I hope they are skintastic!